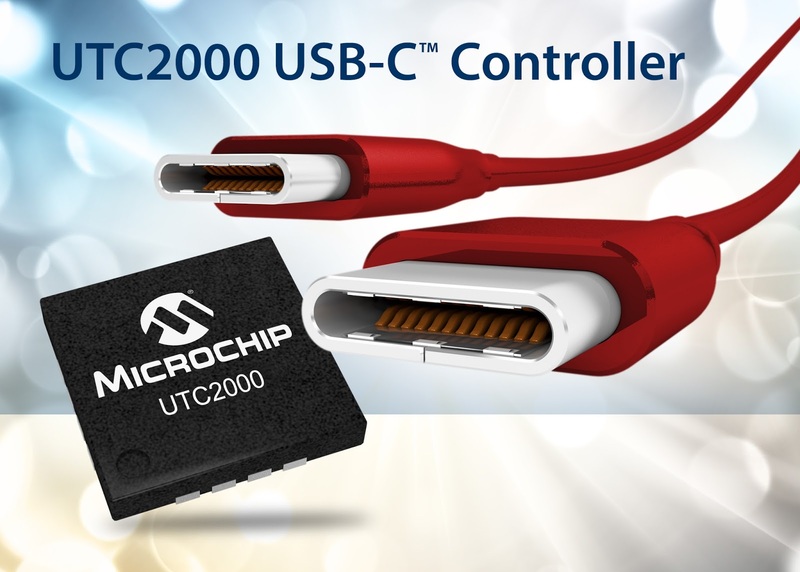 Microchip Technology Inc., a leading provider of microcontroller, mixed-signal, analog and Flash-IP solutions, has announced the addition of the UTC2000, USB-C™ controller to its leading portfolio of USB devices. With this new device, designers of a wide range of applications covering the consumer, industrial and automotive markets can now simply and quickly implement the radically updated USB-C connector cost effectively, speeding time to market and minimizing bills of materials. Housed in a 16-pin QFN package, the UTC2000 controller's small form factor also enables the deployment of USB-C connectors in mobile applications. To learn more about the USB-C connector revolution, visit: http://www.microchip.com/USB-C-081715a. The USB-C cable is now poised to become the "universal" cable, as it is capable of supplying data transfer speeds of up to 10 Gbps, 100W of continuous power flow and ultra-high-bandwidth video capabilities made available through alternate modes—all with a single connection and cable. For designers wishing to take advantage of the new standard with the same blazing-fast transfer speeds at the lowest cost point, the UTC2000 controller supports up to 15W of power, ideal for a wide range of applications in the consumer (e.g., notebooks, printers and accessories, docking stations, mobile devices and battery chargers), industrial (computers and handheld devices) and automotive markets (e.g., head units, break-out boxes and USB battery chargers), among others. "Microchip is well known for its full complement of robust USB solutions, and we are excited to include support for the emerging USB-C standard at the entry-level market tier," said Mitch Obolsky, vice president of Microchip's USB and Networking Group. "The UTC2000 controller allows our customers to easily add the new USB-C connector to their products, with minimal design time, resources and risk." Microchip's expertise with the USB-C standard provides designers integrating the UTC2000 controller into their products the confidence of meeting all requirements for USB-C compliance. Additionally, Microchip makes it easy to take full advantage of the USB-C benefits while lowering development costs and product-launch delay risks. The UTC2000 USB-C controller is supported by Microchip's UTC2000 Evaluation Kit (part # EVK-UTC2000, $99.99), which is available today. This kit enables designers to easily convert a traditional USB connector to type C for both UFP and DFP. The UTC2000 USB-C controller is available now for sampling and volume production in a 16-pin QFN package, for $0.61 each in 10,000-unit quantities. For additional information, including samples and evaluation kits, contact any Microchip sales office, or visit Microchip's Web site at http://www.microchip.com/UTC2000-081715a. Microchip Technology Inc. (NASDAQ: MCHP) is a leading provider of microcontroller, mixed-signal, analog and Flash-IP solutions, providing low-risk product development, lower total system cost and faster time to market for thousands of diverse customer applications worldwide. Headquartered in Chandler, Arizona, Microchip offers outstanding technical support along with dependable delivery and quality. For more information, visit the Microchip website at http://www.microchip.com/Homepage-081715a. 0 comments on "Microchip UTC2000 USB-C controller enables Simple and Quick Implementation of Popular Reversible-Plug Connector for USB Devices and USB Cabling Into Wide Range of Applications"